Snoring is a pervasive problem for millions of people throughout the United States and beyond. Sounds from snoring can range from the soft gurgle of a sleeping baby to resembling the power of a lumberjack with a chainsaw. Although many cases of snoring are not hazardous to the health in a direct manner, snoring may be an indicator of serious health problems. And even if your health is intact, the loud noise at night can certainly impact the quality of life of your family, roommate, or partner! Partners who have to live with a snoring spouse are often sleep deprived and grumpy. And the person who is doing the snoring probably isn’t getting enough sleep either. While there is no actual cure for snoring, there are certainly some treatments for the problem that can help to restore healthy sleep and get your back on track in your relationships and in your life. Treatment for snoring can be as serious as the need for surgery, or it could be less invasive and include weight loss, humidification of the room, allergy medication, anti-snore pillows or other devices. Some snoring is temporary as it relates to winter colds, summer allergies, or some other seasonal issue. It is always a good idea to talk to your doctor if you have chronic snoring that happens more than three nights a week and lasts more than three weeks. But many times, doctors will rule out any serious cause of snoring and simply send you back to your home with little in the way of solutions. This is when you know it’s time to try an anti-snore pillow! Why Use an Anti Snore Pillow? People snore for a variety of reasons, but it always has to do with an interrupted flow of air during sleep breathing. If the air flow is interrupted in the nose, people have a tendency to mouth breathe. Gravity, excess fat pockets, or inflammation in the throat may also lead to restricted air flow, particularly if a person is sleeping flat on their back. As the air passages are restricted, the air that does come through is subject to rough passage which creates a vibration and causes snoring. As mentioned previously, sleeping flat on the back is the worst position in relationship to snoring. Gravity is working against you when you sleep on your back and your breathing passages are more likely to be blocked. When the head is inappropriately positioned during sleep, the back of the tongue can slip down into the throat and cause difficulty by restricted sleep breathing. Although some people try to switch sleeping positions to their side, this can be very difficult to do when you’re….well, you’re sleeping! Anti-snore pillows work in a couple of different ways. First, these types of pillows are often firm which allows them to prop up your head and neck, working against gravity that might be blocking your breathing passages and causing the snoring sounds. These types of pillows also may improve sleep posture to keep the jaw closed and promote neck alignment so that sleep breathing happens more smoothly and less noisily. This pillow is constructed from a layer of 1.5” memory foam on top of a firmer foam based. 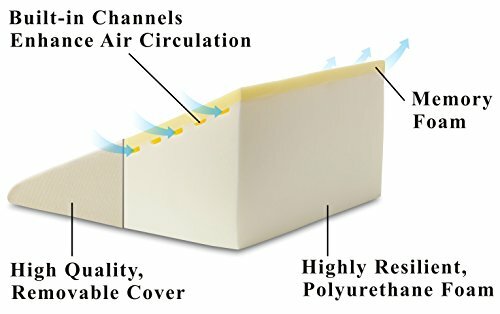 Built-in channels help the memory foam layers to promote air circulation and keep the sleeper from getting overheated. This version also comes with a cover that is machine washable and can be useful for people who have snoring problems as well as back and neck pain issues. This type of pillow is usually placed on top of the mattress, but some people may also have success when they place it underneath a thin mattress pad to provide support without discomfort. The best anti-snore pillow for people who sleep on their side will help to correct sleeping posture. 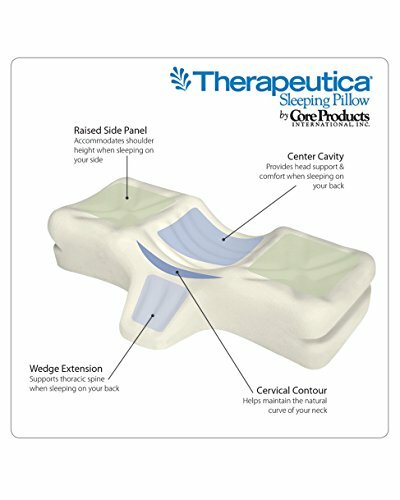 This pillow works well to provide orthopedic support to the neck and back while maintaining the best position for open airways. This pillow is constructed from non-toxic, non-allergenic foam that firmly supports the head and neck during sleep. It’s available in five different sizes to provide the best possible fit for each individual person. Developed by an Ergonomic Designer working with a Chiropractic Doctor, this high quality anti-snore pillow is well-crafted and should last for years to come. And it has a five year warranty to make sure of that. Just as snoring has many causes, it also has a variety of treatment solutions so an anti-snoring pillow may not work for everyone. Some people use snoring pillows alone, while others may need to use one in conjunction with other natural anti-snoring methods such as nasal strips, a bedroom humidifier, allergy medication, or other treatments. Snoring 101 ~ Start Here! The good news is that it is a non-invasive, affordable option that can’t really hurt anything if it doesn’t work out for you personally. Also, if you’re a spouse who is trying to be sneaky about snoring solutions, purchasing a new pillow for your partner might be a great way to go about it! Snoring can be stressful in that it causes lost sleep which can impact everything else about your life. An anti-snore pillow could be the simplest, natural solution to your snoring problems.